Quadruple Labs: What's so special about these bathrooms? What's so special about these bathrooms? This is a question that I have asked myself and many of my friends a million times probably. After one of the recent most powerful ideas popped up in my mind while I was in the bathroom, I just decided that I have to pay my gratitude for the number of ideas that this bathroom has been a reason for. Hence, I decided that the best way to convey my regards is by writing a blog. I haven't heard of any written material about why ideas pop up in bathrooms. Probably, this blog shall serve as a material in future for people who come across the same question. I should state the incidence of Eureka here. Though I had never read about it, I had heard about this instance many times from different sources. When Archimedes realized the Archimedes principle of buoyancy, he came on the streets running naked and shouting "Eureka! Eureka! Eureka!" If he had realized something related to water and he came out running, I think it's easy for anyone to guess that he was running out of bathroom. So the best law that rules a branch of Physics today was born in a bathroom. That far lies the history of ideas taking birth in a bathroom. I have heard many bathroom singers just like how many of you have and some of you are. Many of us make our bathrooms as our self-motivation zones. It becomes the ideation zone at times. It is the best singing and dancing zone as there's no one else to comment or ridicule us. Total freedom is all that I can say. I just keep wondering as to what is that exclusive freedom that all of us realize and experience while we are in bathrooms. Probably, the fact that one is already naked in the bathroom and nothing more can be lost makes a person totally free to express his mind and heart out. 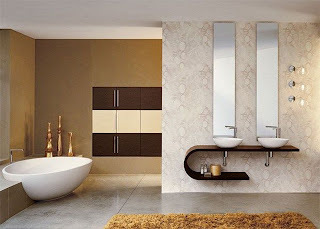 Being in bathroom is a momentary moment of relinquishing all the pride and tensions that we carry on our heads. As we are cleansing our external body, being in bathroom gives sufficient time for a person to clean through the stuff on mind as well. Probably that's the reason why many high profile people prefer a shower more than once in a day. Anyways, I must thank the bathroom that has helped me out of difficult situations by ideating the right ideas at the right time. It's your chance to thank your bathrooms as well!